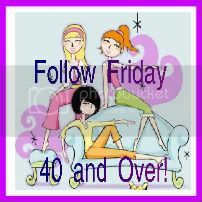 Welcome to the 58th edition of Follow Friday 40 and Over!! Hadn't seen any posts about your dad lately, how's he doing? Hope all is well with you! It's great to have your memes back up and running. Thanks. Hey Girlfriend, How's going? So nice to have you back! Hope you have a wonderful weekend. Thanks for hosting! I've missed you Java - I am so pleased to be back in the mix and especially glad to be here today and joining in this fab blog hop. Thank you, as always, for hosting this. You meet the nicest people here. This is great. I participated for the first time 2 weeks ago and found some great new blogs. Hi Java, hope all is well with you and yours! :) Thanks for hosting another great week! Oooooh Friday!!!!! The one time over 40 has felt good this week...thanks for hosting! Hi Java, Sorry it has been awhile. Alot's been going on and I am reviewing and doing giveaways and everything else sorta got lost. Trying to make a better effort at stopping by at least once in awhile. Hope you are doing okay.